For its time, the antislavery movement was quite sophisticated in its use of the available media to spread its message. In fact, the skillfulness of antislavery “propaganda” was one of the reasons the movement was so feared and disliked. 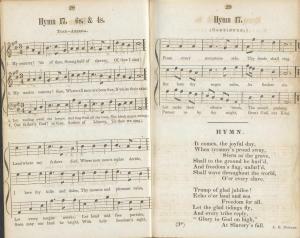 Abolitionist writers took familiar tunes and provided them with new lyrics that were scathing attacks on slavery and its defenders. Changing the words to the patriotic tune “America,” for example, would have been quite controversial in most communities. Description: Jarius Lincoln, [ed.] Anti−Slavery Melodies: for The Friends of Freedom. Prepared for The Hingham Anti−Slavery Society. Words by A.G. Duncan. (Hingham, [Mass. ]: Elijah B. Gill, 1843), 28−29.